Outages result over peering, the connections between websites and internet service providers that determine how they exchange traffic so data can be carried. Sometimes, these companies don’t get along.This slowdown is a reminder of what kind of internet we may have once the new rules axing network neutrality protections hit: They’ll allow internet providers to legally block or throttle access to websites, and are slated to go into effect as early as January 2018. Everyone has a sluggish Monday sometimes. This week it’s the turn of … what feels like the entire internet? Right now, two major backbone internet service providers, Level 3 and Cogent, appear to be suffering from massive outages and downgraded service, according to the ISP monitoring service Downdetector, which collects and analyses network status reports to determine early interruptions. According to Downdector’s outage maps, internet users in San Francisco, Los Angeles, Chicago, Boston, Dallas, Atlanta, New York, Philadelphia, Baltimore, and Washington, D.C., are being hit the hardest. 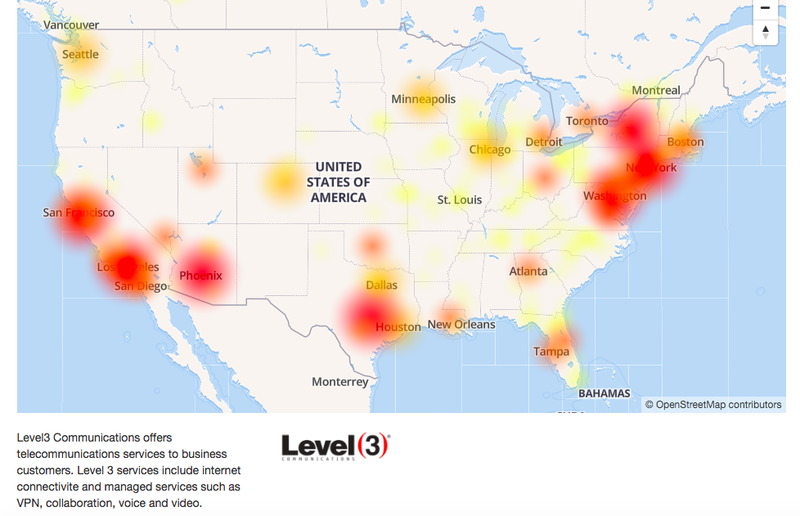 Comcast also appears to be suffering outages, though they’re less severe than those hitting Cogent and Level 3. Backbone internet service providers work directly with large internet platforms like Netflix to deliver large amounts of data across networks, and also work behind the scenes of consumer-facing ISPs. Since the internet is an interconnected mess of wires, disruptions with Level 3 and Cogent could impact service for Comcast and Verizon users in turn. Slate reached out to Level 3 and Cogent to ask if they’ve determined the cause of the disruptions. This is where people are the most annoyed. The internet is a network of networks, and slowdowns can happen all the time for any number of reasons. These could be regular, vanilla network maintainance problems. More worryingly, it could be the side effect of a massive botnet, like the Mirai botnet that was identified last October when hundreds of thousands, possibly millions, of internet-connected devices sent junk traffic to Dyn, a major domain name service provider, to cause severe outages across the internet. Sometimes outages are the result of disputes over peering, a term used to describe the connections between websites and internet service providers that determine how they exchange traffic so that data can be carried from one part of the internet to another. Peering depends on pacts between internet companies, but sometimes, these companies don’t always get along. Take what happened in 2010 between Comcast and Netflix: Comcast said that Netflix’s high bandwidth video traffic demanded more from Level 3’s network then what they originally agreed to, and for a time, Comcast refused to upgrade its networks to handle Netflix’s increased traffic until they struck a new deal. Even worse, in 2008, a peering dispute between Cogent and Sprint became so bad that the two companies stopped exchanging traffic entirely, and the internet was momentarily portioned to the point where different parts of the internet couldn’t communicate with each other. But since this time the outages are happening with host Cogent and Level 3, a peering dispute is unlikely the culprit here. This slowdown is also a reminder of what kind of internet we may well have once the new Federal Communications Commission rules axing network neutrality protections hit the books: They’ll allow internet providers to legally block or throttle access to websites, and are slated to go into effect as early as January 2018. The current outages are probably not a case of your ISP behaving badly—but come next year, that very well could be the case.